This lavishly illustrated Book of Hours, in Latin and French, was illuminated by a master of the Pichore workshop and another artist. Each full-page miniature consists of multiple scenes in various architectural frames, functioning like a window. 198 x 132 mm. – 143 leaves. With 15 full-page compositions and 15 small miniatures. 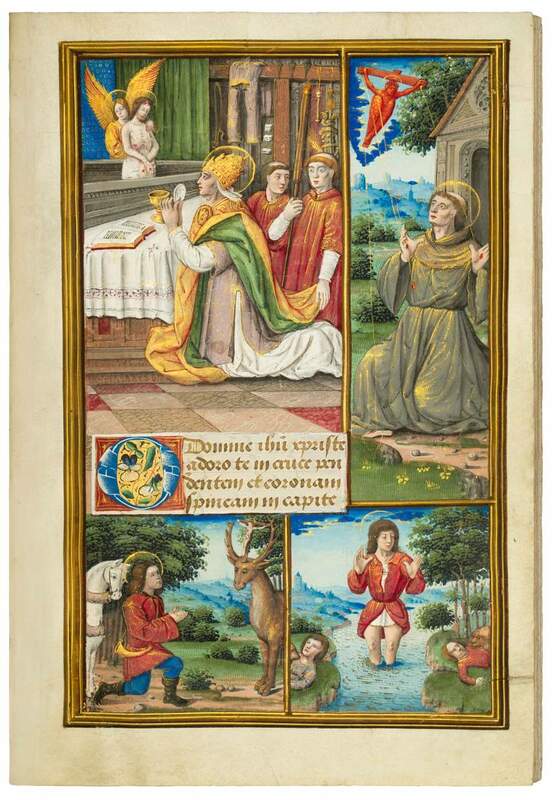 This unusual and beautiful Book of Hours was made for or commissioned by Louis XII, King of France (1462-1515). Like his famous father, Charles of Orléans, Louis was a great bibliophile who preferred manuscripts to printed volumes in his exquisite Blois library. Some special features distinguish this personal prayer book from other works of the same period. First of all, it contains an unusual set of illustrations that accompany the texts: most Hours of the Virgin are accompanied by scenes about the Life and Passion of Christ, which is quite rare in France and more common in Flanders or England. Another surprise is the organisation of the work. The manuscript appears to have been originally conceived by a regional artist, who also carried out a great deal of the illumination. This master was assisted by an elaborate artist from the Parisian workshop of Jean Pichore, who executed some outstanding and famous manuscripts for Louis XII and seems to have been one of the king’s favourite artists. Compellingly, the two artists not only divided the illustrations to be painted, but actually worked together in many of the same miniatures.